If you are true patriot, then this incredible story will be the best thing you read all day. Earlier this morning, the National Rifle Association exhumed the corpse of American superman Ronald Reagan and placed it in the luxurious massage chair at a Brookstone outlet store! Wow. What a beautiful way for the NRA to honor an American hero! The NRA began its amazing tribute to the dead and wonderful President Reagan at the Brookstone outlet located in the Fair Oaks Mall in Virginia. 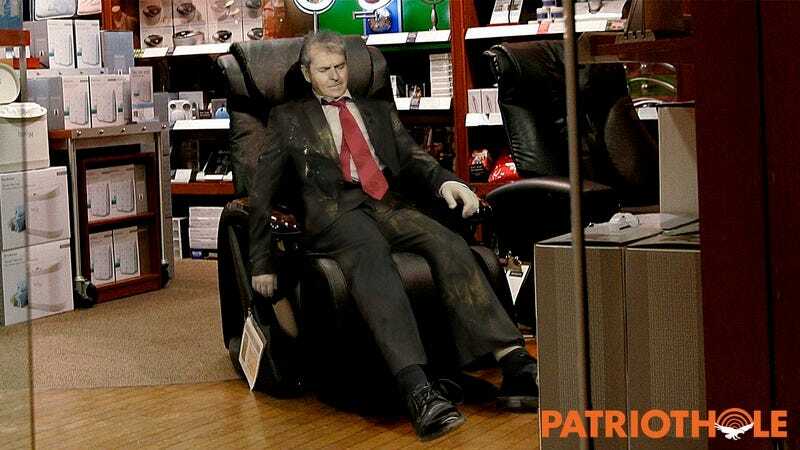 As soon as the store opened, NRA vice president Wayne LaPierre pulled Ronald Reagan’s corpse inside by the ankles and dragged it directly to the glamorous Infinity Riage X3 massage chair that Brookstone keeps on hand for customers to sit in for short trials. The former president’s partially decayed corpse was still fairly heavy, but that didn’t stop LaPierre from struggling for 45 minutes to hoist the heroic corpse of this American superman into the lavish, top-of-the-line massage chair, where the powerful mechanical rotors began to jostle Reagan’s body around in a manner truly befitting such a majestic president. Could there be a more moving celebration of a patriotic American messiah like Ronald Reagan? LaPierre and dozens of other high-ranking NRA officials could barely hold back their tears as they saluted sweet, powerful, dead Reagan, watching the massage chair’s powerful rotors jiggle his body all over the place. Wayne LaPierre also tried to throw a rose at Reagan’s wiggling muscular carcass, but he missed. Sadly, all great things must come to an end, and after President Reagan’s patriotic corpse had scrambled around in the massage chair for about five minutes, the manager of the Brookstone came over and said that the dead body had exceeded the time limit for how long a customer was permitted to sample the chair. He then pushed Reagan’s corpse off the massage chair and onto the ground, even though there was nobody else in line to try it. How fitting that even in death, this dutiful American hero should continue to preserve law and order by honoring the shopping policy of every store he visits! What an incredible gesture! Ronald Reagan is so strong and beautiful, and plus he died! His commitment to defending the Second Amendment and the right of all Americans to have guns means that he truly deserves to have his corpse bounce around in this very expensive and extravagant Brookstone massage chair. If you love your country at all, you’ll join us in thanking the National Rifle Association for this amazing tribute to a real American hero!